This has got to be one of the most beautiful and regal birds sharing the forest with us. Often heard in our forest, but seldom seen, it mostly remains elusive to amateurs and avid birders alike. The Narina trogon (Apaloderma narina) is a medium-sized (up to 34 cm long), largely green forest bird in the Trogonidae family. It is the most widespread and catholic in habitat choice of three Apaloderma Trogons. The species name is Khoi in origin, believed to come from Narina, the mistress of the French ornithologist François Le Vaillant. Both sexes have vivid, gingery green upperpart plumage. The tail feathers have a metallic blue-green gloss. The outer three rectices on each side are tipped and fringed white, giving the undertail of perched birds a characteristic white appearance. The wing coverts are a grizzled to colourless grey. The male especially, has bright amaranth red underside plumage and bare, green gape and eye flanges. The female has brown face and chest plumage, blue skin orbiting the eyes and duller red plumage below. Immature birds resemble females, but have distinct white tips to the tertials (inner wing), and less distinct gape and eye flanges. The species has a large range in Africa, inhabiting lowland to highland, valley and forests, from tropical to temperate regions, those occurring in highlands dispersing seasonally to lower levels. It is found from Sierra Leone to Ethiopia, and East Africa to eastern and southern South Africa. Due to its wide range and varied habitat choice, the Narina trogon is considered to be a species of least conservation concern. Although reasonably common, it is a shy, unobtrusive bird, found either singly or in pairs. The Narina Trogon is easy to overlook, as well, despite its bright colours, because it often sits very still in an upright, though slightly hunched, position. Feeding habits: These birds’ feeds mainly on insects, and small invertebrates (butterflies, caterpillars, moths, spiders, mantids, cicadas, grasshoppers, beetles, and termites) but also on fruit and rarely chameleons or other small reptiles (skinks). It hunts by sitting motionlessly on a perch, occasionally moving its head side to side and up and down, looking for prey. Once the prey is located, the bird rapidly flies to it with highly manoeverable twists and turns, grabbing it before returning to its perch. It takes caterpillars from twigs and foliage or hawks for insects in flight. 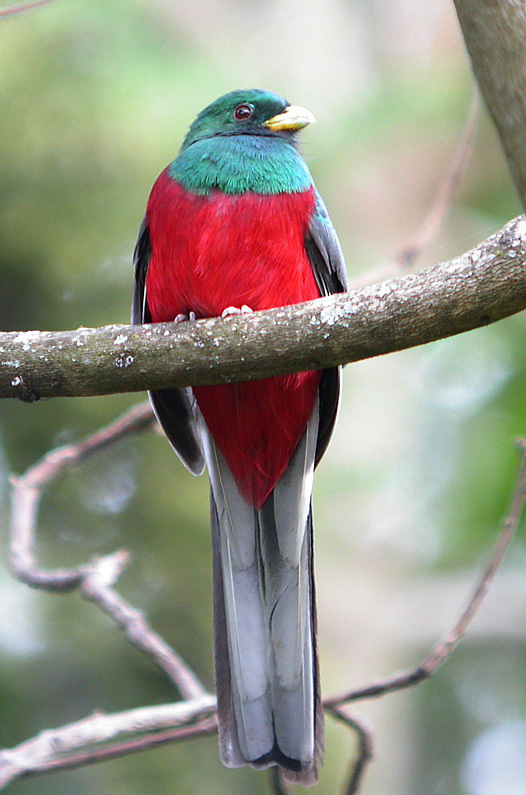 The Narina Trogon is just one of almost 40 trogon species that inhabit forested regions of the world. But only three of these species are found in Africa. Apaloderma, the generic name for these birds, means ‘thin skinned’. It was given to them because of the fact that it has a very thin skin, indeed, that tears easily when skinned! The Nerina Trojan is also called: Narina Trogon [English]; Bosloerie [Afrikaans]; Intshatshongo [Xhosa]; Trogon Narina [French]; Narina-trogon [Dutch]; NarinaTrogon, Zügeltrogon [German]; Trogón de Narina [Spanish]; NarinaTrogon [Swedish]; Trogone Narina [Italian]; Republicano [Portuguese]; Narina Trogono [Esperanto]. 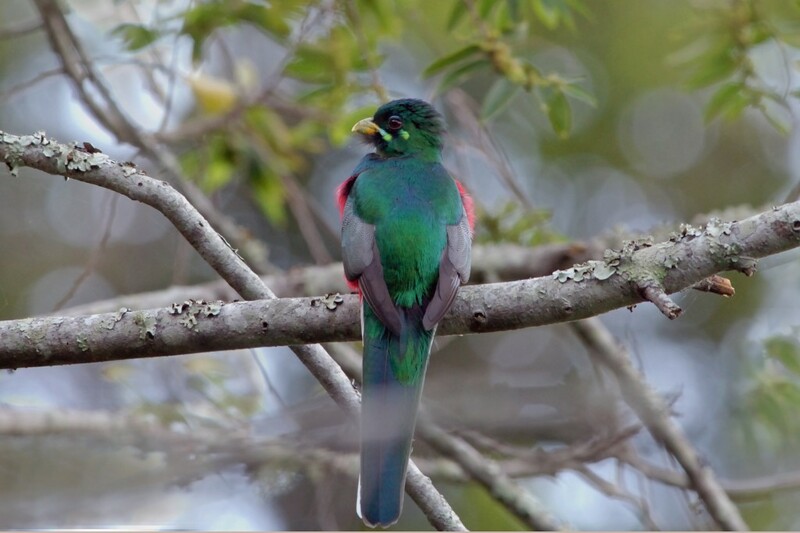 This entry was posted in Eco awareness, From the Garden Route, Our forest birds and tagged Birdlife, Trogon. Bookmark the permalink. ← Ten million viruses in one drop of seawater!